Today was Day #5 of Chocolate and Belize Theme Week. Joshua Rosen, owner and chocolate maker at Charm School Chocolate (Baltimore, MD) crafts non-dairy chocolate bars from scratch. And the bars I've tried have all been made with cacao from Belize. The beans are "stone ground in small batches from single origin cacao," according to information on the company's website. Today's 49% cacao Coconut Milk Chocolate Maple Candied Pecans bar was made with cacao beans from Maya Mountain Cacao (in the Toledo district of Southern Belize), Georgia pecans, and maple syrup. Subtle hints of sea salt, cinnamon and grains of paradise* help round out the flavor profile. Crispy, crunchy and flavorfully sweet nutty texture harmonized with smooth underlying coconut milk chocolate. Coconut milk takes the place of cream and/or milk -- and if you didn't know this fact, you could be easily fooled. There is no strong coconut taste to these bars. 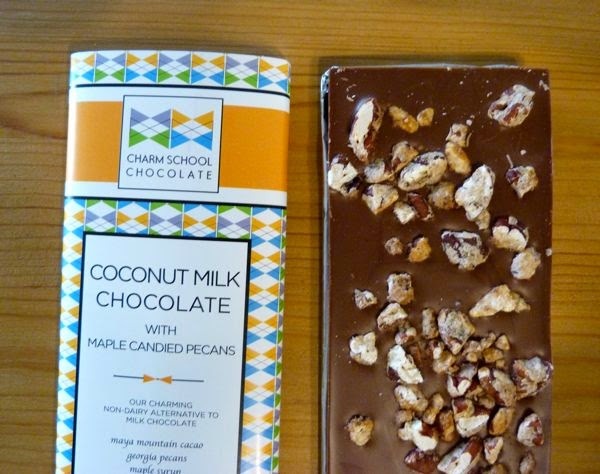 Charm School Chocolate bars are soy free, certified vegan and made with organic ingredients. *Grains of Paradise (Aframomum melegueta) is the name of a spice, related to ginger (with flavor notes often likened to black pepper and/or cardamom), native to West Africa but also found in the Caribbean and Latin America.